This reusable T-shirt tote bag made from 190T polyester is strong and durable enough to replace your disposable grocery bags. It folds into a small snap pouch for easy carrying. 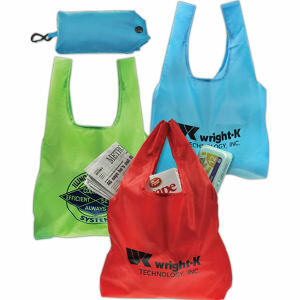 Plus, no one will miss your company name and logo when you giveaway these promotional T-shirt tote bags. Learn more about our promotional products services or call 954-523-1957 to speak to a representative.